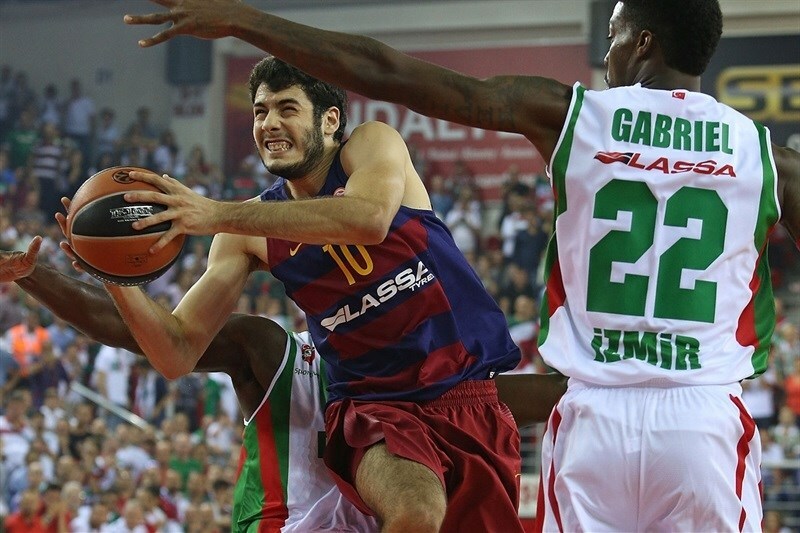 In the opening game of the 2015-16 Turkish Airlines Euroleague season, newcomer Pinar Karisyaka Izmir made its debut in the competition a memorable one by downing FC Barcelona Lassa 71-62 in a Group C contest on Thursday. Karsiyaka took the lead for good on the final play of the first half, a basket-plus-foul from Colton Iverson, then opened the third quarter with an 8-0 run, and finished it with a 10-0 spurt for 54-38 margin. The hosts’ lead was never in doubt the rest of the way, as Iverson finished with 16 points and 8 rebounds. Kenny Gabriel posted 12 points and 10 rebounds, Justin Carter netted 11, and Joe Ragland had 10 points in victory. 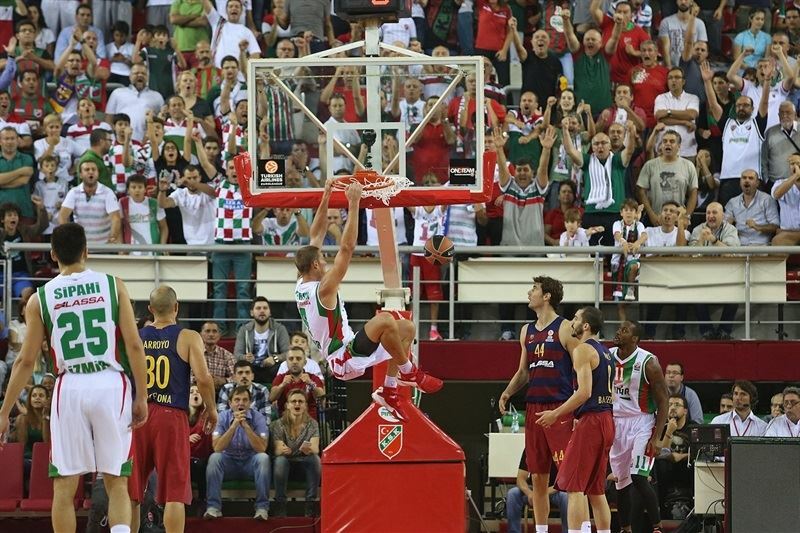 Justin Doellman collected 14 points and 7 boards for the visitors, and Stratos Perperoglou scored 11 for Barcelona. 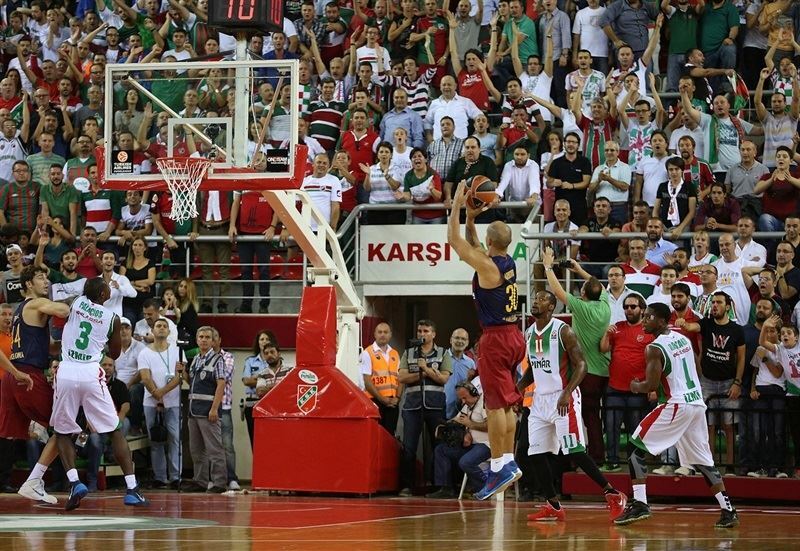 Kenan Sipahi scored the first basket of the 2015-16 Euroleague season, a triple for the newcomer. 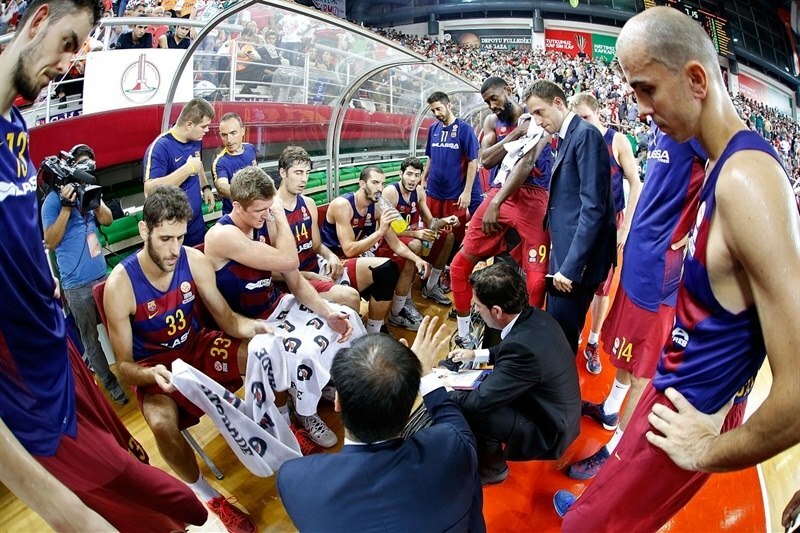 Pau Ribas hit a jumper to open Barcelona's account, but Iverson answered with a two-handed slam for the hosts. The teams continued trading blows, as Doellman and Iverson traded jumpers to make it 7-4, and after Alex Abrines hit a mid-range shot, Iverson was at it again, scoring from close range. Carlos Arroyo answered from long distance for the visitors' first triple and Doellman added a put-back that made it 11-11. After a two-minute scoring drought on both ends, Doellman gave Barcelona its first lead, but Iverson answered with a floater, before Joe Ragland drove the lane for a layup and then buried a second-chance three-pointer for a 3-point edge. However, Brad Oleson nailed a corner three to end the first quarter at 18-18. 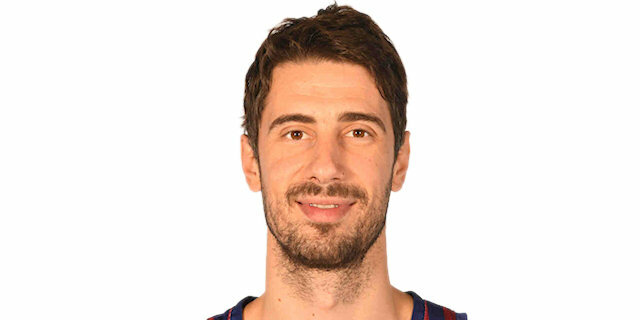 Juan Carlos Navarro made a jump shot to score his first points of the season, and Aleksandar Vezenkov made a baseline shot inside for a 19-22 edge. 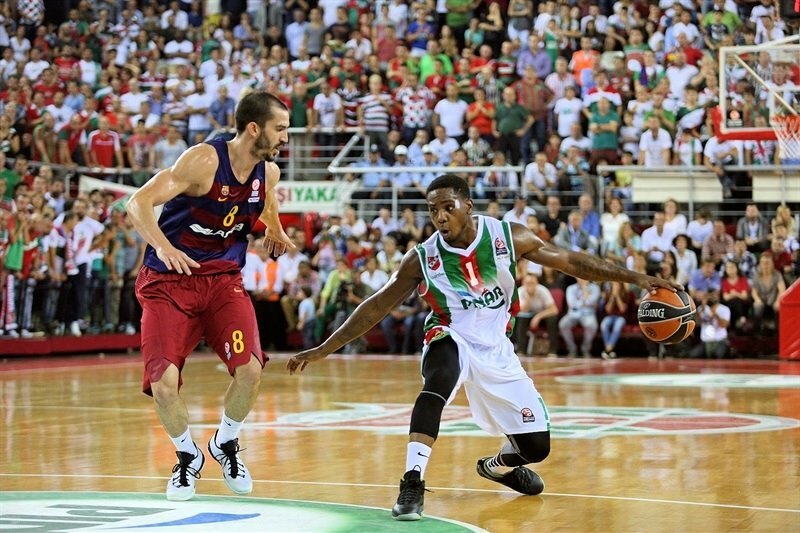 Ragland dribbled through Barcelona’s defense, but Perperoglou had a driving layup of his own. 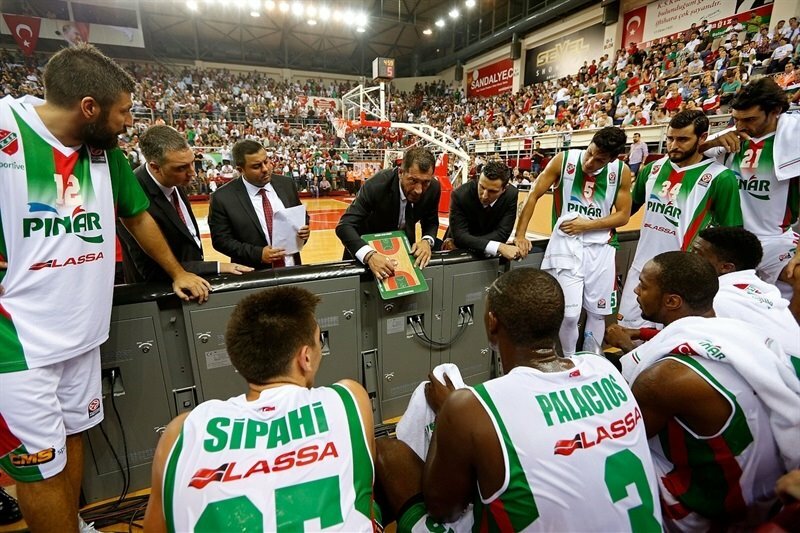 Sipahi made a mid-range jumper for Karsiyaka, and a fastbreak dunk from Gabriel put the hosts back in front, 25-24. 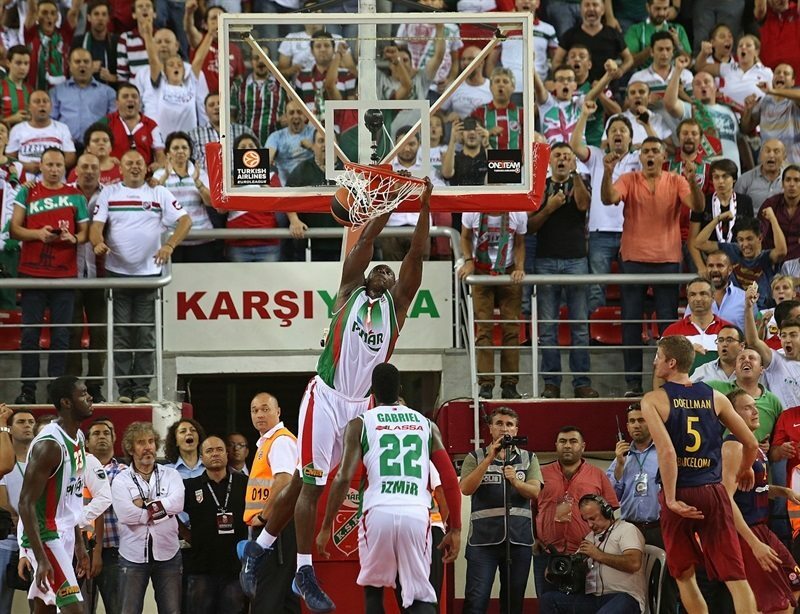 Karsiyaka held the visitors without a single point for more than four minutes before Ante Tomic split free throws with 89 seconds left in the half. 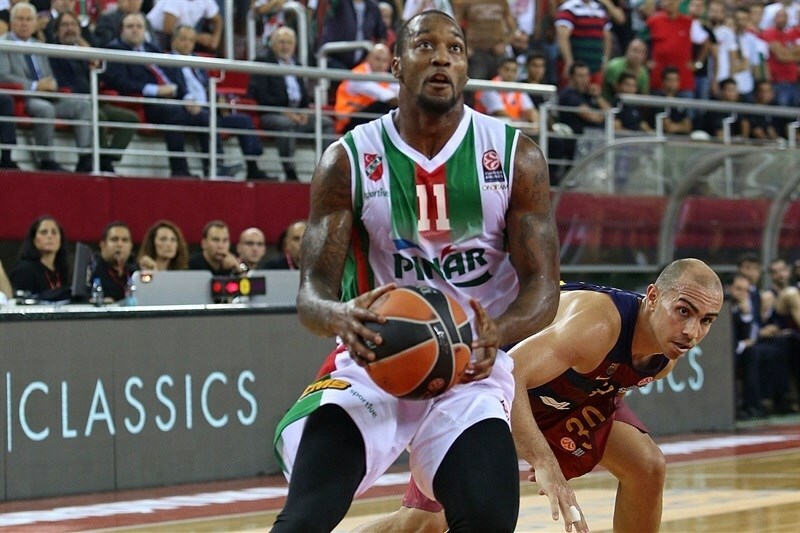 In the final minute, Justin Carter split foul shots, Tomic made a pair, and after a couple of timeouts, Iverson ended the quarter with a second-chance three-point play, giving Karsiyaka a 29-27 halftime edge. Gabriel and Iverson scored from close range on back-to-back possessions at the start of the third for 33-27. After Sipahi made a steal and assisted Justin Carter for a big dunk, Josh Carter drove the lane for an up-and-under layup and a 37-27 lead. 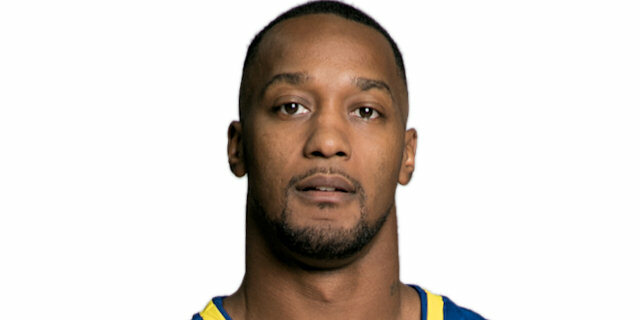 Doellman and Navarro made jumpers for Barcelona, but Justin Carter’s triple restored a 10-point lead. Oleson answered with a sweet runner off the glass, but Iverson matched it with a two-handed dunk. Arroyo’s triple cut the deficit to 44-38, but Kerem Gonlum scored a layup after a give-and-go with Iverson, and Gabriel followed it with a steal and an easy fastbreak layup for a commanding 48-38 advantage. Ragland’s three-pointer extended the margin to 13 points, and Gonlum’s three-pointer in the final seconds of the third made it 54-38. Doellman hit from long range to open the scoring in the quarter and after a baseline jumper from Juan Palacios, another triple from Doellman and a fastbreak scored from Perperoglou cut it to 56-46. Gabriel drove for a layup, and after Ribas scored an easy two on a fast break for Barcelona, Gabriel’s put-back dunk made it 60-48. Tomic scored inside midway through the fourth, and a steal and a fastbreak layup from Perperoglou got Barcelona within 60-52. Palacios made a reverse layup for the hosts, but Perperoglou bettered him with a triple from the corner. However, Palacios nailed a shot from mid-range, then Carter drew 3 foul shots and sank all of them for a 67-55 lead with 1:51 left. An alley-oop dunk from Shane Lawal kept the visitors’ hopes alive, and after a timeout Perperoglou scored from close range and Lawal split free throws to make it 67-60 with 44 seconds on the clock. 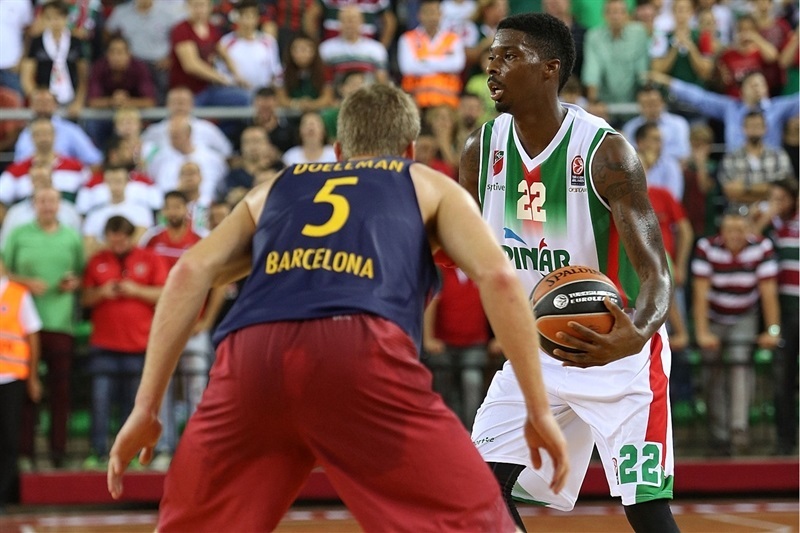 Another Barcelona steal, this one from Doellman, led to Tomas Satoransky sinking 2 free throws, and the visitors almost forced another turnover, but Karsiyaka fought off a full-court press and Gabriel’s huge dunk sealed the deal with 20 seconds to go. "Unbelievable win for us. I told my before the game it will not be easy for us. 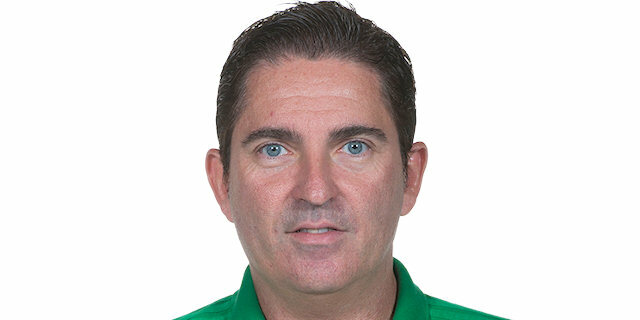 They are a really big club, with many very experienced players. But we are a good team, and with our fans, we can beat anybody. " 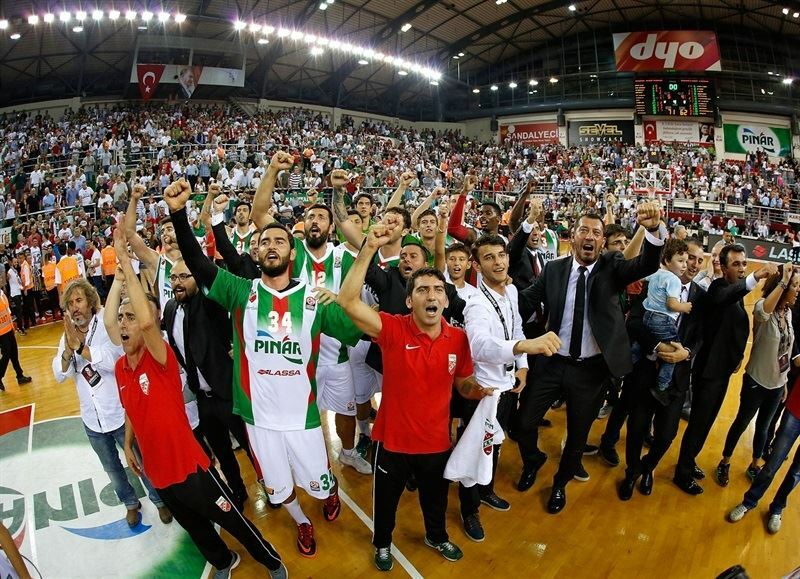 "First of all, congratulations to Pinar Karsiyaka for its great game and its win. It was the best team tonight. We had a bad night and this is game that, in general, we must forget about. We had very bad three-point shooting percentage and were out of the game in many moments, but especially at the end of the third quarter, where Karsiyaka took a big lead. The third quarter was decisive, we had 6 turnovers in that period. Our start and end of the third quarter decided the game. We lost control of our emotions and our focus. We had a very strange game. This hadn't happen to us before. Fan support was very important for us not playing a good game." "We played hard. We are at home, we got great fans. We just have to play hard. We know they are tough team to play, they have a great system, great coach, great players. We just played our system, played hard, and held the home-court advantage." "There was a lot of noise but we are used to playing in this kind of atmosphere. It is a tough loss that we can't forget. 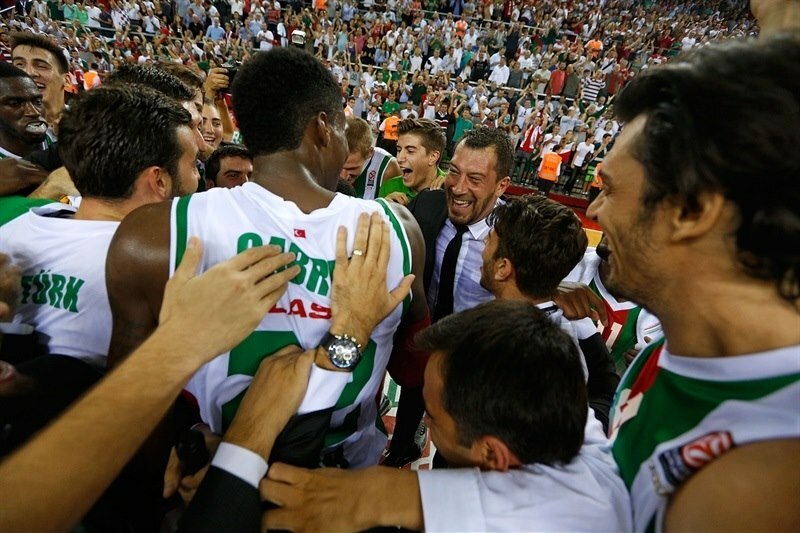 We have to learn from this, keep getting better and start winning on the road in the Euroleague. A lot of things happened today - a lot of turnovers, lack of inspiration on offense and of course, our third quarter, which we didn't start well, they got the lead and it was tough to come back. The only good thing is that we have many games ahead of us and we have a lot of chances to bounce back from this."